I tried to connect to MSSQL from QGIS and I couldn't find any solution to my problem. 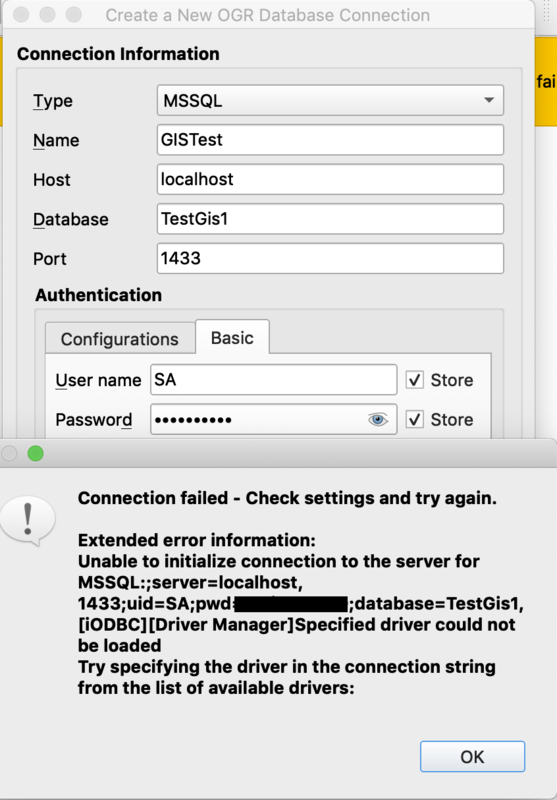 I install MSSQL on my Mac with Docker and try to connect QGIS with localhost(host=localhost) and left the DSN empty, also inserted USER&PASS. I tried to insert the IP instead, even mentioning the port (1433), nothing helped. Did anyone have an idea how to solve this issue? Browse other questions tagged qgis sql-server sql-server-spatial or ask your own question. How to connect QGIS to an Oracle DB (SDE)?